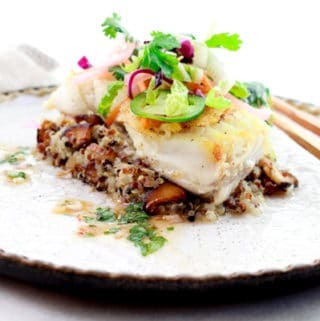 Last Updated: April 16, 2019 · Published: January 14, 2019 By: Asian Caucasian 13 Comments This post may contain affiliate links or sponsored content. Nothing is more comforting or healing than a hot bowl of Matzo Ball Soup on a cold winter’s day. 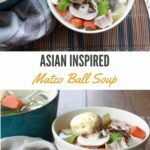 Here’s my twist on the traditional with my Asian Inspired Matzo Ball Soup recipe, loaded with so much flavor! My grandma used to make the best matzo ball soup, and my mom too! It’s just the easiest soup to make, either on the stove or in a pressure cooker. I prefer the stove-top method. 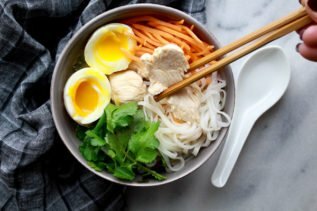 I’ve altered the classic recipe with some Asian flavors (garlic, ginger, lemongrass, and cilantro) but all of the other ingredients remain the same. 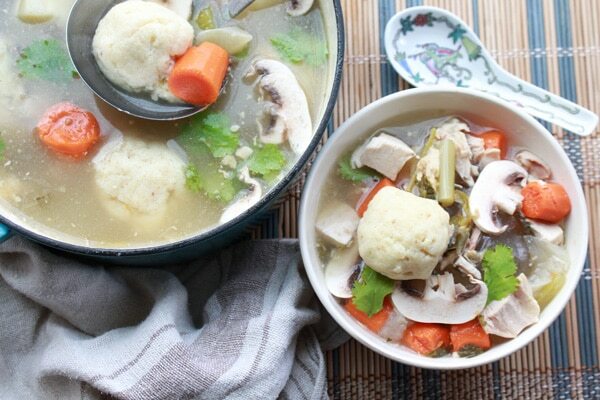 Matzo ball soup is probably the best medicine for the sniffles, so listen to your mother and eat your chicken soup! 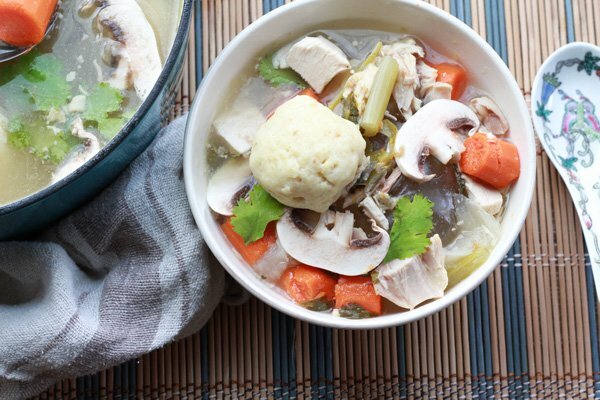 One of the most healing soups, this Asian Inspired Matzo Ball Soup will surely warm your tummy and help with the winter sniffles! In a bowl, combine the eggs with the seltzer and the oil. 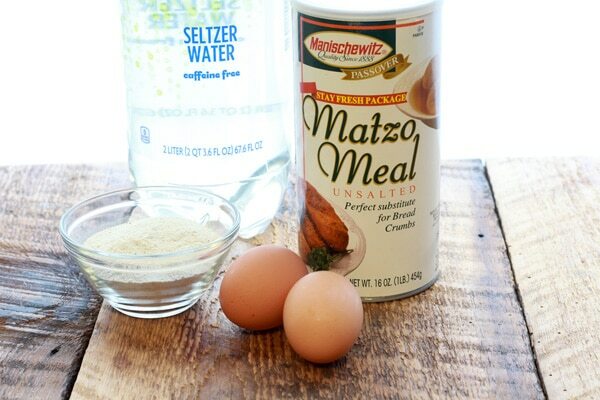 In another bowl, stir together the matzo meal with the baking powder and salt. Add the dry ingredients to the wet ingredients and stir to combine thoroughly. Refrigerate, uncovered, for at least 30 minutes. 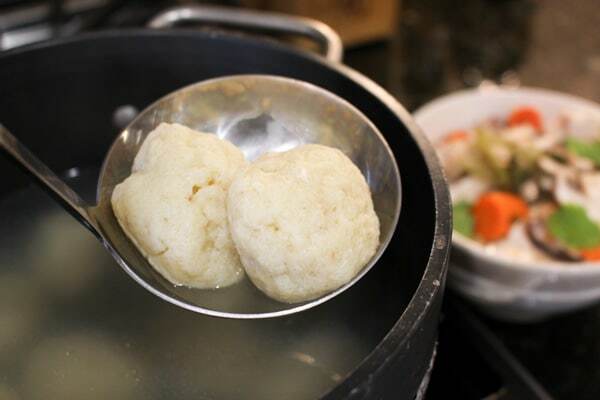 Using wet hands, form the matzo ball mixture into 1-inch balls and add to a boiling pot of water. Lower to a simmer and cover for about 20 minutes. The matzo balls should be light and fluffy. Remove from the pot and ladle the matzo balls into the chicken soup. These matzo balls are light and fluffy! They soak in the flavor of the soup and are a real highlight of this chicken soup recipe! In a large stock pot filled with water, add a 3 to 4 pound chicken and the vegetables and herbs. Bring to a boil, then lower the heat, cover and simmer for 45 minutes. Remove from the heat. Strain the broth, reserving the chicken meat (cube or shred the chicken) and the vegetables, but discarding any bones and chicken skin. 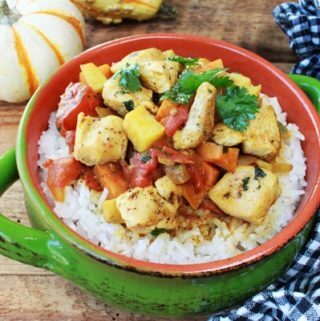 Place in the refrigerator overnight for the best flavor. 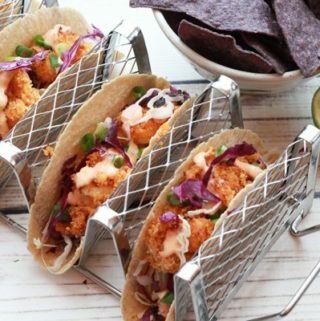 Add the matzo balls when you’re ready to serve. It’s that easy! 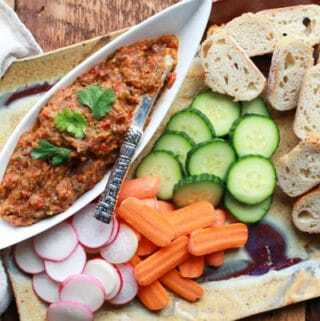 This is not your grandma’s matzo ball soup! 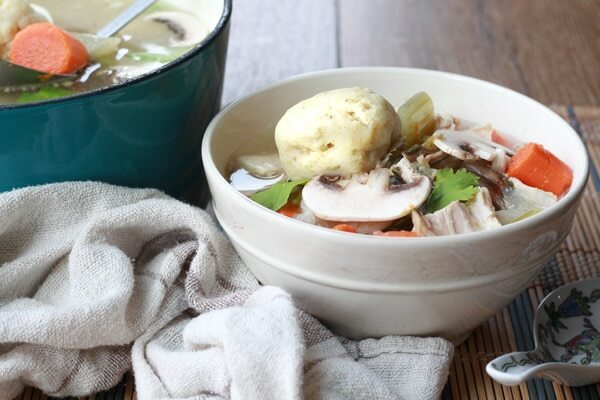 This Asian Inspired Matzo Ball Soup is loaded with so much flavor and extra veggies. It’s the perfect soup on a cold winter’s day! You’re very welcome, Ramona! It certainly is comforting this time of year! 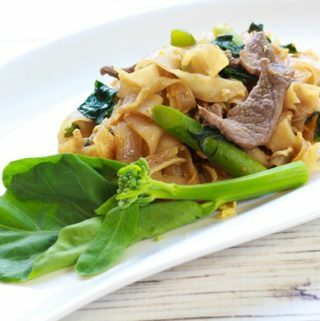 Love the fusion of a comfort classic with Asian flavours – perfect for the cold weather and delicious! Thanks, Amanda! Was feeling a bit under the weather and this matzo ball soup just picked me right back up! Looks delicious! Love all the photography. Thank you so much, Amanda! This soup is extremely comforting! I had some last night because I had oral surgery the other day and doctor’s orders were soft foods and soups. Hit the spot! Wellll…. you can always use the boxed matzo ball mix for a perfectly fluffy matzo ball every time! 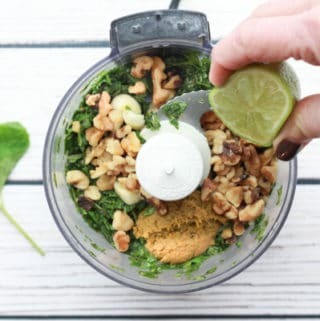 I often use it because it’s quick and no-fail delicious! Good luck! Let me know how it goes! The Matzo Ball Soup /”chicken soup” sounds amazing. 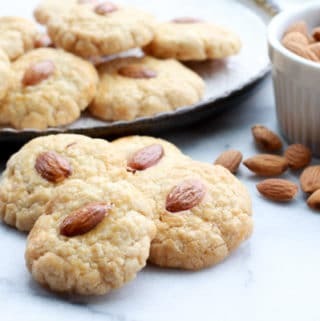 I hope this recipe really makes them fluffy, I have tried two recipes already and they were a flop. Maybe that was me making them a flop lol, we will see. This was absolutely delicious! Combined my love for matzo ball soup and asian food! Just perfect! 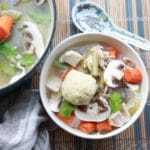 So glad you like this Matzo Ball Soup recipe, Hannah! 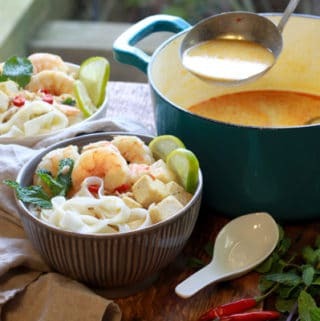 I particularly love this soup during the winter months and when I’m feeling under the weather! I’ve never tried matzo ball soup before but I love Asian flavours and this sounds like such a great combination of flavours too – definitely a great winter warming recipe. Thanks, Corina! Matzo balls are a lot like dumplings but fluffier. They should float to the top of the soup. 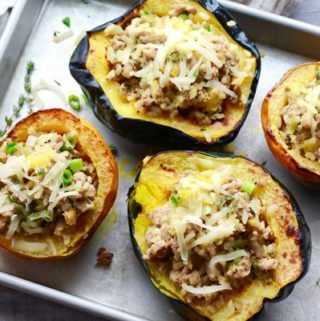 I hope you try this recipe, so comforting in these cold months!